A Lancashire man is believed to have set a record by completing marathons in every summer Olympic host city. Andrew Ronnan, from Whalley, crossed the finish line at the Melbourne Marathon on Sunday, reaching his goal of running a marathon in all 22 cities. The 56-year-old completed the event in just under five hours. Roger Biggs, chairman of the 100 marathon club, keeps a record of multiple marathon runners and believes it is a UK record. He said: "It is safe to say it's never been done by anyone in the UK." "I'm not sure about the rest of the world, although I don't know of anyone else who has done it." 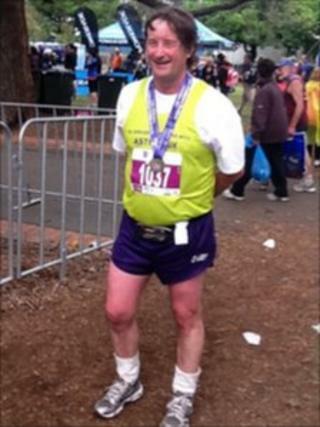 Mr Ronnan has spent the summer in Australia and ran the Sydney marathon on 19 September which he completed in 5:09:51. He said: "I'll never trouble the podium because I train on Guinness and spuds." The idea of running marathons in the summer Olympic host cities came to him in 2005 when London was chosen to stage the 2012 games. He said: "I realised I had already done a few so I did the European ones and then went for the others." Mr Ronnan ran his first race in London in 1998 and Melbourne was his 41st marathon. He intends to keep on running "to keep the weight off". "I'm hoping to run my 15th London marathon for Asthma UK next year and all being well do the Olympic city every four years. "My ultimate ambition, though, is to do at least one marathon with my children and grandchildren." The cities which have hosted the Olympics since the first games in 1896 are: Athens, Paris, St Louis, London, Stockholm, Antwerp, Amsterdam, Los Angeles, Berlin, Helsinki, Melbourne, Rome, Tokyo, Mexico City, Munich, Montreal, Moscow, Seoul, Barcelona, Atlanta, Sydney and Beijing.